The Internet is filled with awesome things. From cuddly cats and twitchy corgis to amazing web experiences and inspiring images. In this edition of Awesome Web Design of the Week we are going to get happy with Pharrell Williams’ awesome interactive music video. We cannot deny that music has a special hold on us humans. It has the power to get us inspired, energized and make us relaxed. Music has also fueled different innovations that we are enjoying now such as online streaming and music sharing. If you haven’t heard about Pharrell Williams’ latest and one of the most innovative music video (not to mention an awesome web design too) for 2013 then you must be living under the rock or just buried with work. So what is this music video that we are telling you about? Well, for starters the song Happy was originally from the soundtrack of Despicable Me 2. Using the same song Pharrell created the world’s first 24 hour music video. We too are surprised with this and after some digging around we found out the video was produced by Universal Home Video and Iconoclast with the help from the Paris-based directing team, We Are From LA. 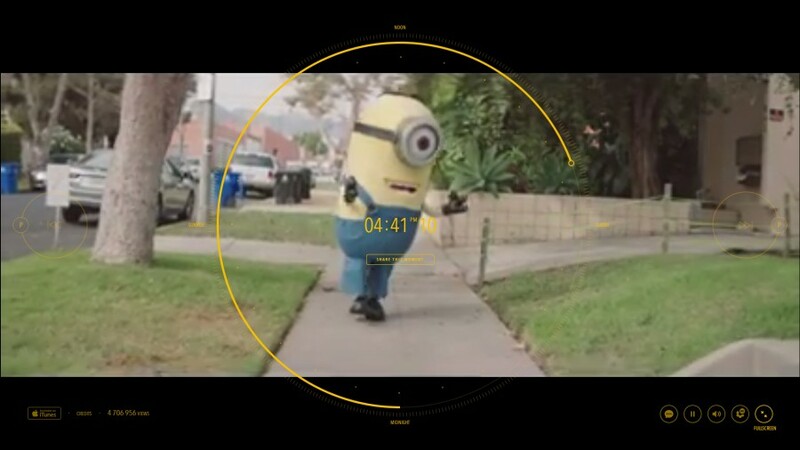 The video enlisted the help of some 400 dancing extras, the video was shot using a steadicam in various locations throughout Los Angeles. It took the team eleven days in order to complete this massive music video. While the song and the video itself are amazing we cannot help but love the awesome web design and experience of Pharrell’s 24 hour happy music video. Depending on your computer time, the website will play the corresponding video. The experience also allows you to choose on specific time slots or you can jump straight to the parts with Pharrell in it without changing the the timeline of the song. You can also check out the comments section wherein different user comments are time stamped and linked to the parts of the video. The interface design is nice and clean plus, it automatically hides the interactive clock interface. For those who are feeling down and out we suggest you guys check this out. If you are feeling a little chirpy this is a great site to compliment your mood as well. As of this writing the website gained 4 million hits and still counting ever since it was launched last November 21. 24 Hours Happy is a clear testament that music videos has a bright future and we cannot wait for the next ambitious project. What do you guys think? Are you planning to watch everything? We like to hear it from you guys so do share your thoughts at the comments below!